Includes 21 songs inspired by Green Day, The Beatles, Bob Dylan, Toto, Bonnie Raitt, Bruce Springsteen, U2 and more. Includes the 21 songs in song sections as well as over 1,300 MIDI files in 2 bar grooves and fills. Platinum Grooves Volume 2 includes 21 songs played by Stevie DiStanislao (David Gilmore, David Crosby) in varying styles from classic rock and punk to blues. All 21 songs are split into sections like: Intro, Verse, Chorus, Solo and Ending as well as including free-time Ending Fermatas. For ease of use, all songs are also included separated into two bar grooves. 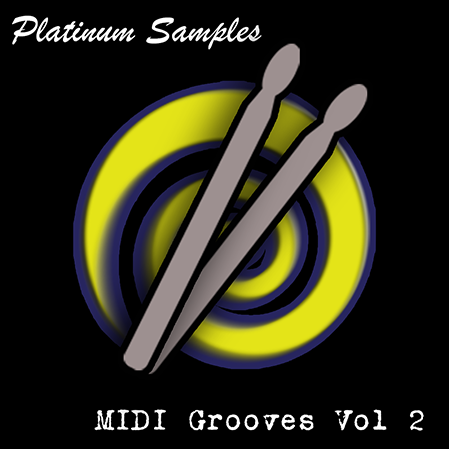 This multi-format collection includes grooves formatted for BFD3®, BFD2®, BFD Eco®, EZDrummer®, Superior Drummer®, Addictive Drums®, Steven Slate Drums 4, Accent as well as General MIDI Standard MIDI Files which can be used with any GM compatible drum software or hardware --- this includes drum machines and synthesizers which have drum sounds. Platinum Samples are one of the foremost producers of drum samples in the world, with over 50 years of experience in the professional music industry.